Bacopa Monnieri is a plant native to India. It is one of our best aids for focus and attention. Natural medicine does not offer a one-size-fits-all solution for focus and attention. We don’t have a “natural Ritalin™” that works immediately for everyone. As the truism goes, everyone is different. One distracted person may simply be sleep-deprived. Another may be anxious. A third may be dealing with a sensory-integrative disorder, or apathy, or compulsive thoughts. Or food allergies. Or they may be bored by the subject matter. Or, they may actually be plain “hyperactive.” Or all of the above. 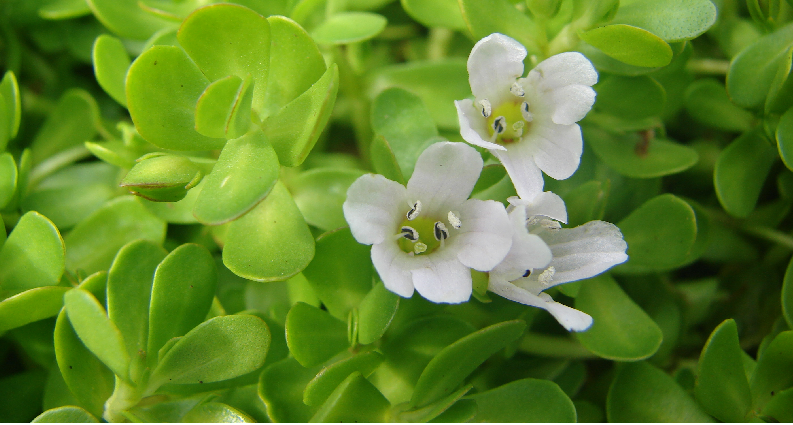 Brahmi (Bacopa monnieri): I enjoy this herb a lot. I enjoy recommending it to people. I use it myself. It promotes a state of meditative calmness, centered concentration, and focused alertness. It’s not like “flip-a-switch”-level dramatic. But give it a few days, and you may be pleasantly surprised. Research? One double-blind study helped adults 40-65 years old remember new things they had learned. Another study showed “improved speed of visual information processing… learning rate and memory consolidation.” Another study found benefit in working memory. There was a single-blind trial where normal children did better in school, and a double-blind trial where kids with ADD did better on a number of cognitive tests. Rats who take it seem less anxious. In my experience, Bacopa “puts the blinders on” – in a good way. It keeps you focused on what’s in front of you, while shielding you from peripheral stimuli (internal and external). If you’re trying to read, and then you look at the clock… look out the window… think about dinner… glance at the teevee… and then forget what you were reading in the first place, Bacopa might be the herb for you. Musicians find it helps them practice longer. It’s contraindicated if you’re hyperthyroid. Otherwise, it’s pretty safe. I like the supercritical Bacopa extract from Tattva’s herbs, one of the few that’s strong enough to work in just 2 or 3 pills. Some people take those pills throughout the day. Others load up all at once before a test. The body needs Vitamin B6 to manufacture serotonin, dopamine, and norepinephrine – the three neurotransmitters most responsible for global mood and behavior. It’s also crucial to essential fatty acid metabolism, including the body’s (limited) ability to synthesize EPA and DHA from dietary precursors. Most of us have enough B6 to get the job done. But some of us can use a little more help. My big indication for B6 is when you can’t remember your dreams – when you wake up in the morning with a complete “blank.” My other big red flag for B6 is really bad PMS. In these situations, I point to 50-100 mg, twice a day. It may slightly improve attention and focus – and PMS – and help you remember your dreams! Give it a month. The bulk of my experience with hawthorn is with the physical heart, where it gently and reliably strengthens weak and erratic function. It’s only recently that I’ve begun giving it to children for fidgety and anxious distractibility. It tends to work over a day or two. It’s hard to come by hawthorn jam in this country (although you can usually find some at the Russian store, heavily sugared), but hawthorn syrup is available. You can also find it in combination formulas that are easy to give children, including the wonderful Calm Child™ liquid and chewables distributed by Roy’s company, Planetary Herbals. Silk Tree / St. John’s Wort: Both of these herbs are often used as antidepressants, but that’s an oversimplification. They don’t make you “happy” as much as they make you “content.” So I like them for people who live with a sort of existential discontent. People who want to sigh, slam the book shut, and pace around – or simply look out a window and daydream about greener pastures. Silk tree is the more powerful herb, in my opinion. One of my favorite formulas in the store is David Winston’s Grief Relief, a liquid combination of silk tree bark, hawthorn berries (mentioned earlier), and rose petals. I use it for extreme agitation, on its own, or combined with the Chinese formula Xiao Yao (mentioned later). It normally takes 3-5 days to become noticeable. It doesn’t taste too bad, either. Rhodiola Rosea is an adaptogen, which is to say it’s a ginseng-like herb that mitigates the effects of stress. Where Rhodiola really shines is in what I call “white-collar stress” – sleep deprivation, cognitive fatigue, and general brain overload. Some good research here: one study looked at doctors on night call, another at med students during a stressful two-week exam period. In both of these studies, people took either Rhodiola or placebo daily. As stress began to take its toll, everyone started to lose focus and motivation. They slept worse, and woke up more tired. They did worse on tests of cognitive function and physical stamina. The difference is, the placebo groups went downhill fast. The rhodiola groups held on to their mojo a lot longer. A third study looked at people who volunteered to proofread documents over the course of 24 hours, without sleep. Everyone was given a single dose of Rhodiola, or placebo. At the beginning, everyone was proofreading at the same rate, and making the same number of mistakes. At the end of the 24 hours, everyone was still proofreading at the same rate – but the Rhodiola group was making only one mistake for every six in the placebo group. Like all adaptogens, Rhodiola works best if you take it before the stress takes its toll. Xiao Yao / Easy Wanderer: We stock this ancient Chinese formula in our PMS section. Forgive the implicit bias! Really, there’s nothing gender- or age-specific about it. Look to Xiao Yao for anyone on the anxiety-impulsivity spectrum, anyone who’s quick either to anger or tears. In Eastern medical terminology, Easy Wanderer “clears stagnant heat from the liver.” In other words, it releases pent-up anger and frustration. The “releasing” process sometimes begins with a few days where things get worse before they get better. Generally, people take a substantial dose for a 2 or 3 weeks, then taper to a maintenance dose going forward. Passionflower, Motherwort, Holy Basil, Skullcap, Kava, etc.… are all herbs used to control anxiety. They’re all a little different, but if you’re dealing with anxiety, just pick one – or even better, a formula – and try it. They all work in an hour or less, so you’ll quickly get a sense of what’s helping. Theanine: l-theanine is an amino acid originally derived from green tea. We use it to promote feelings of calm and relaxation. Theanine is well-researched in both adults and children. In fact, one of my favorite studies with theanine used college-age women as its study subject. Half the women were randomized to take a moderate dose of theanine. The other half took a placebo. They were then all subjected to a stressful exam. The theanine group reported feeling calmer and more relaxed. Their brainwaves were calmer and more relaxed. They remained focused and alert. A standard dose for adults is 200 mg, 2 or 3 times a day. There are also 100 mg chewable gummies which are great for kids. Magnesium is (among many other things) a subtle and pervasive relaxant for both the mind and body. Outside of attention issues, I most often recommend it for people who are physically tight (think fibromyalgia and muscle cramps). It also plays an important role in calcium management in the body. For focus and attention issues, I reach for magnesium when people seem physically tight, even twitchy. Maybe they grind their teeth. Magnesium is found in unrefined grains and beans, nuts and seeds. So I’m especially conscious of it in people who eat little of these. Conversely, it’s needed to counterbalance calcium, so I also look for it with diets that are high in this nutrient. I tend to suggest 200 mg 2 or 3 times a day for adults. For tension issues specifically, I tend to recommend a form called magnesium glycinate. White Chestnut Bach Flower Essence: Flower essences are different from standard herbal extracts in the sense they’re very, very dilute. They’re considered to have captured the energy of the plant rather than the physical chemical constituents of herbal supplements. Zinc is a crucial mineral involved in hormone and fatty acid metabolism, and dozens of other metabolic functions. It has been researched in ADHD, with mixed results. I’d reach for zinc if I were also reaching for B6 – they work together. Characteristics that suggest zinc include: male, teenage, physically hyperactive, and suffering from acne (which the zinc may also help). A standard dose is 60 mg a day. Give it a month.